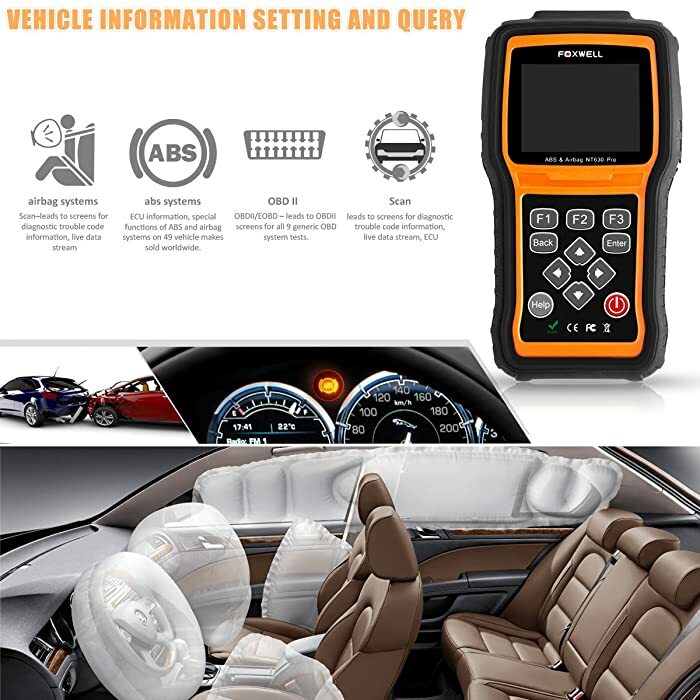 The Best Airbag Code Reader is what you’re looking for? Then you’ve landed on the right page. Airbag code readers are also known as airbag scanners or SRS scanners that are used to diagnose the SRS/Airbag system in your cars. There are hundreds of airbag scan tools out there, which makes you confused choosing the right one. 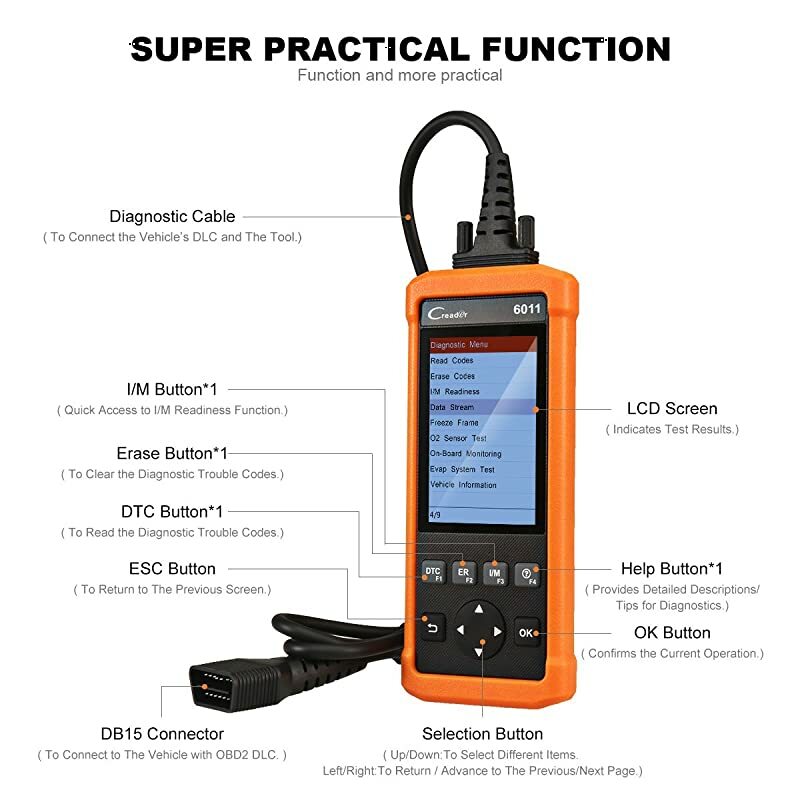 In this post, we’ve reviewed the 9 best SRS diagnostic tools in the market 2019. I’ve also prepared a comparison table of the Top 3 Best Airbag Code Readers for your convenience right below. Cons The menu is not easy to navigate. Not good for TPMS Programming. Requires a 20-pin converter. May have compatibility problem. Poor customer support. Bottom Line Professionals will also enjoy its range of specialized features dedicated to a vehicle’s TPMS. It is for owners of BMW models from 2001 to 2017, including X Series, Z Series, and the Mini. Launch X431 V is built for professional mechanics. A more affordable option for BMW drivers is the MAOZUA Creator C310 airbag code reader. 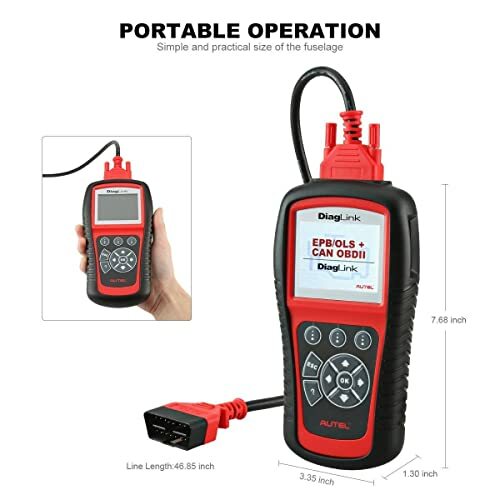 This code reader offers to perform tasks such as clearing adaptations, reading and clearing error codes, displaying live stream data graphs and resetting the engine oil light. 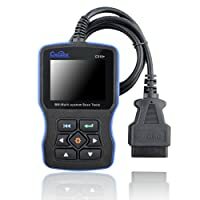 This device supports BMW between 2001 to 2017 and offers several functions. The airbag tool is also capable of scanning and displaying vehicle information and clearing airbag error codes when the airbag light malfunctions. It’s compact, the lightweight build is quite ergonomic allowing for easy one-handed operations. All the data is displayed on a bright 2.8″color LCD. This handheld scanner also comes with USB 2.0, which can be upgraded for free. In as much as it supports every diagnostic function, including live stream data reading and graphic displays, it’s compatibility limits it to only one automotive brand. Nevertheless, BMW users will find it to be a great airbag tool, provided they use it with the recommended 20-pin adapter. It is compatible with BMW models from 2001 to 2017, including X Series, Z Series, and the Mini. The MD802 is clearly built for advanced users. Professionals will find it ideal for their tech-heavy requirements. At the same time, car owners will not be overwhelmed since it is fairly easy to use and understand. Automotive scanners don’t get much better than the Autel DiagLink (MD802 DIY version) from Autel. Its compatibility with popular car models from Asia, Europe, and America is only surpassed by its powerful functionality. 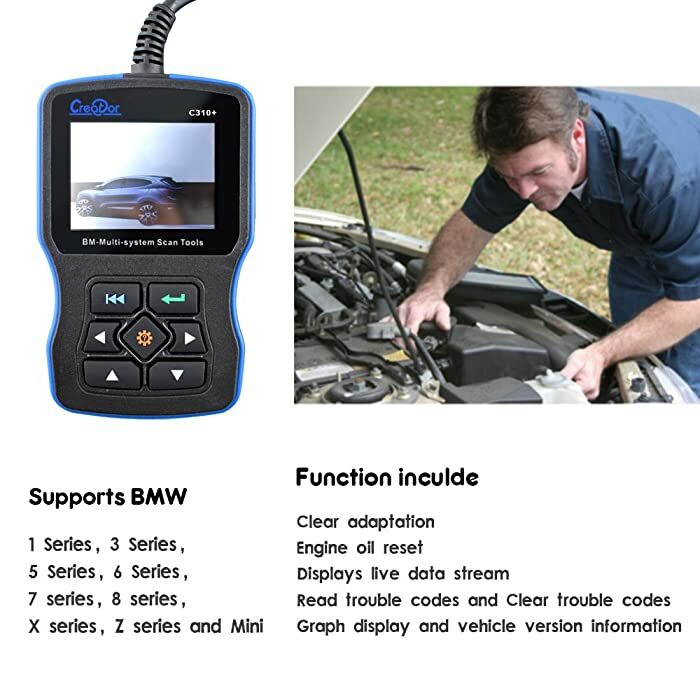 This is a serious car diagnostic tool with the ability to read and clear trouble codes on all vehicle systems. 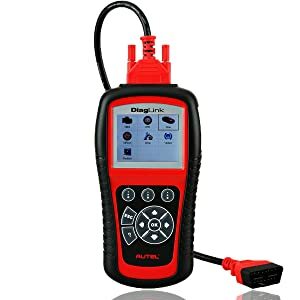 Diagnostic functions that can be performed with the Autel DiagLink include full OBDII scanning, reading and erasing codes, live data stream viewing, and 02 monitor testing. Convenient add-ons such as a DTC lookup library makes it easier to understand the root of your car troubles. The Autel DiagLink offers far more comprehensive vehicle coverage, including access to onboard communication modules, the body, and the chassis. The average gearhead would love to have an airbag diagnostic tool with so many capabilities. However, unless you routinely service your car yourself, this is an airbag scan tool that is best left to the pros. Autel DiagLink has a simple and practical size. The Autel DiagLink (MD802 DIY version) is clearly built for advanced users. Professionals will find it ideal for their tech-heavy requirements. At the same time, car owners will not be overwhelmed since it is fairly easy to use and understand. Launch Creader 6011 is one of the best SRS scanners. Everyone who is looking for a way to diagnose the airbag system should take this tool. If you’re just in the market for a basic but accurate OBDII scanner, the Creader 6011 could be what you want. It might not be the flashiest or most powerful airbag code reader you’ll see here, but it certainly gets the job done. Launch CReader 6011 supports several practical functions. Everything about it is beginner-oriented. The fact that it is a budget device, however, doesn’t mean that it doesn’t read and clear DTCs like the best of them. Its simple handheld design, which is nicely complemented by a large LCD screen, enhances its ergonomics considerably, making it a joy to use with one hand. Despite its appearance, the Creader 6011 is capable of dealing with electronic systems such as ABS and SRS. In fact, this airbag code reader can even help you to turn off the airbag light if it malfunctions. The Creader 6011 also reads live data streams, freeze frame data, and I/M readiness status. 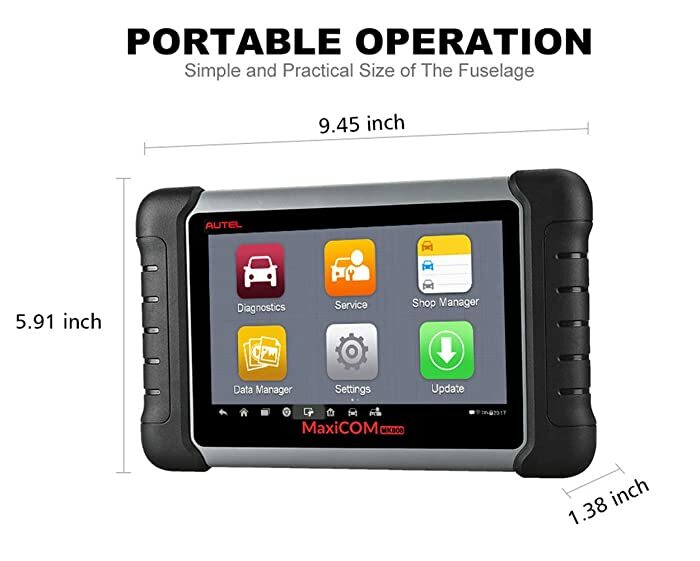 FOXWELL NT630 Elite is an airbag scanner you’d expect to find at auto and body shops mainly because it is powerful and very thorough. From basic DTC reading and clearing and turning off the Check Engine lights to diagnosing ABS, SRS, and airbag systems, it excels in everything it does. 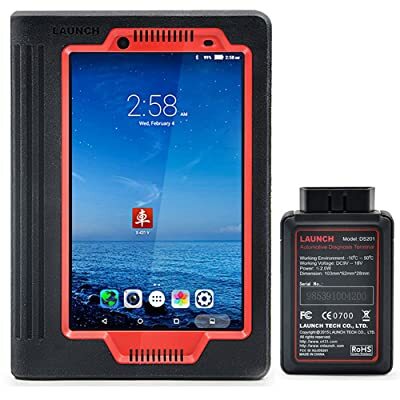 Its construction is pretty impressive, with an impact-resistant outer case and a rubberized sleeve for extra grip and protection. The widely compatible SRS scanner works with vehicles that have either OBD or its second iteration, OBDII. This puts cars, SUVs, and trucks from as late as 2016 into its list of compatible vehicles. FOXWELL NT630 Elite is built for ABS and SRS diagnosis. In addition to reading and clearing DTCs, this airbag code reader shows live vehicle data in text and graph formats. Graphs from different parameters can be viewed simultaneously or even merged to provide the most comprehensive view. The FOXWELL NT630 Elite also promises free software updates for a lifetime and has multiple language support. 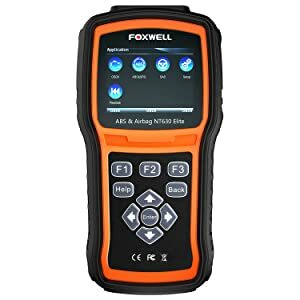 Foxwell NT630 Elite is built for ABS and Airbag Diagnosis. Any car owners or DIY people will find this scan tool to be very useful. The X431 Creader offers affordable professional diagnostics conveniently and comprehensively. It is compatible with over 25 car models from Asia, Europe, and America. X431 Creader offers affordable professional diagnostics conveniently and comprehensively. It is compatible with over 25 car models from Asia, Europe, and America. Among its main functions is testing ABS, SRS, engine, transmission, and airbag systems. Being one of the few airbag codes readers out there, you can use it to reset or turn off a faulty airbag light. The scanner performs DTC reading and clearing, plus it supports all ten OBDII protocol test modes. In addition to that, it can read live OBDII data streams, troubleshoot oxygen sensors and carbon canisters in all vehicles with a standard OBDII from as early as 1996. Tasks such as turning off the check engine light, brake system lights, and airbag lights are made easier with this scanner, but that’s not all it does. It can be used to read and clear DTCs in transmission, engine, and fuel systems as well. Launch X431 Creader VII+ offers a variety of functions. It’s easy to use interface turns it into a user-friendly device with a load of useful features that even the average vehicle owner would find useful. The airbag scanner is handheld and perfectly portable, although its wide profile requires two-hand usage for efficiency. Its durable exterior is complemented by a large easy to read backlit LCD display. It doesn’t need batteries; it is powered via the OBDII cable it comes with. For non-professionals who wish to get a bit more information than what the average OBDII scanner can offer. Compact, lightweight, and easy to use, the Creader VIII is one of the best scanners out there. Its tablet-style design is let down by the overly thick bezels, but that doesn’t dampen its performance in the least. 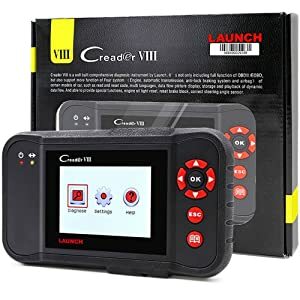 Compact, lightweight, and easy to use, the Creader VIII is one of the best airbag scanners out there. Its tablet-style design is let down by the overly thick bezels, but that doesn’t dampen its performance in the least. The easy-to-update Creader VIII is popular among vehicle owners, though it has what it takes to cut it on a professional level. It features a standard shockproof build with large buttons on the sides of the screen. 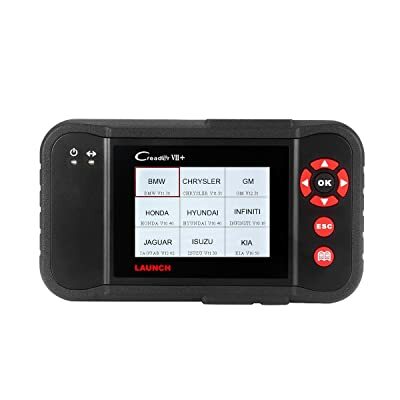 Launch X431 Creader VIII supports SRS ABS and various diagnostic functions. 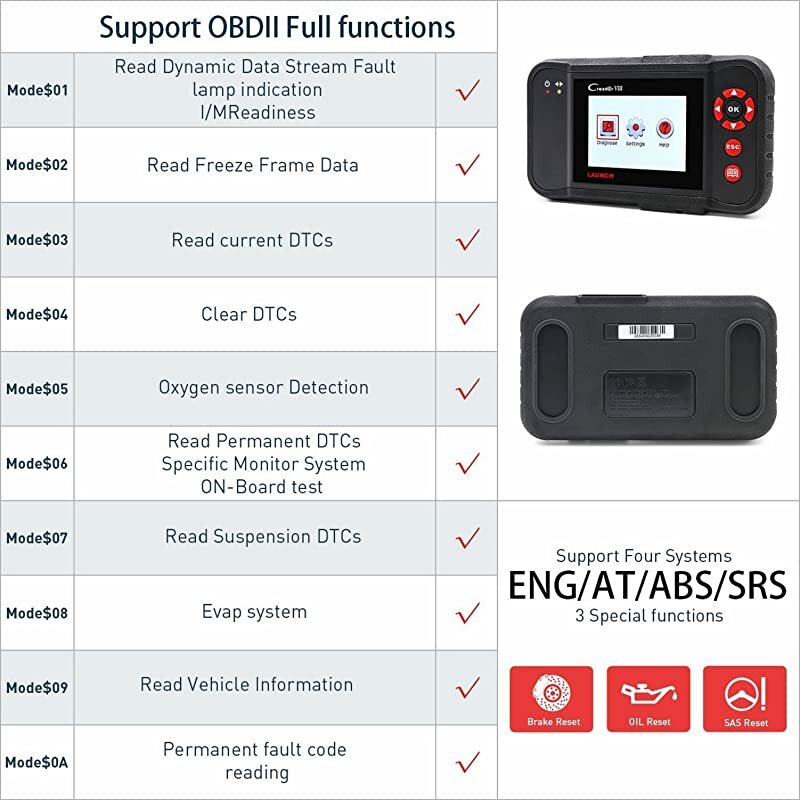 Support for all 10 OBDII protocols including Check Engine light reset, airbag code reset, oxygen sensor tests, engine, ABS and transmission system diagnosis is one of the device’s key features. Check engine lights, SRS lights, ABS lights, and a whole lot of other systems can be read, cleared, and reset using this handy airbag code reader. 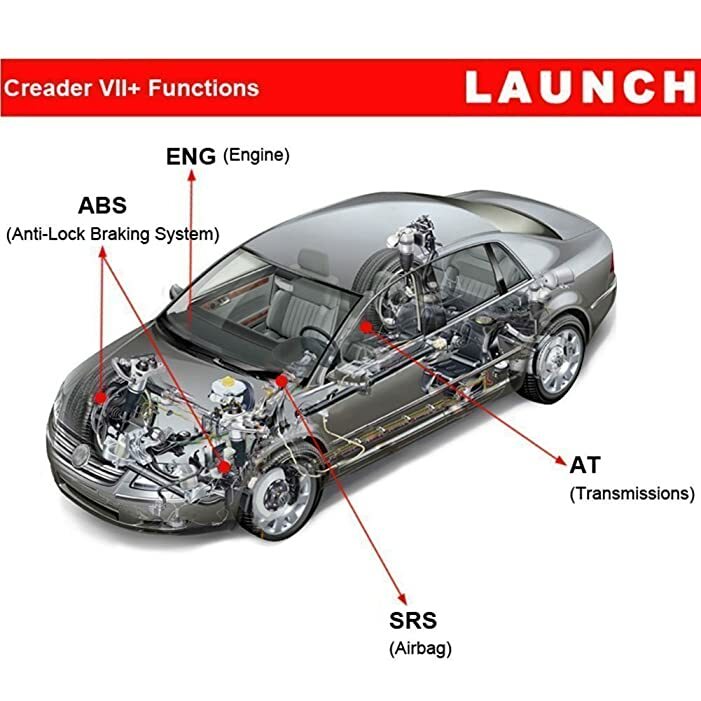 Other than OEM level diagnostics, the Creader VIII offers code definitions, including manufacturer-specific ones. It is compatible with over 20 vehicle models from America, Europe, and Asia. Its simple interface, the broad range of OBDII testing capabilities, and excellent build makes it suitable for commercial applications by professionals. Enjoy more functionality with the Innova 3140g, which OBD coverage with more advanced diagnostic parameters for ABS, SRS, Live Data Stream viewing, and OBDII scanning for all vehicle systems. The 3.5″ LCD is a nice touch. It is bright, attractive, and quite easy to read both under normal conditions and in low-light environments. At 4″ wide, the sleek sensor can be handled with one hand effortlessly. 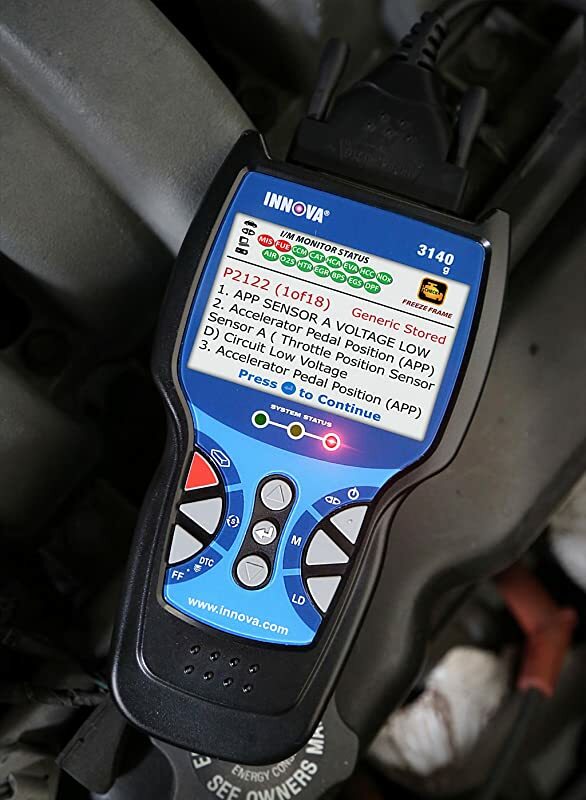 Innova 3140g cover with many advanced diagnostic parameters. Support for older models is a feature that many car owners with OBD1 will appreciate. Live data streaming and graphing, with an option to review the data later on your PC, caters to users with more technical demands. The icing on the cake is the rather convenient Bluetooth app connection. 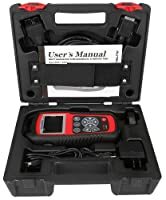 DIY car enthusiasts will enjoy using this just as much as car professionals will enjoy the features offered by this inexpensive scanner. 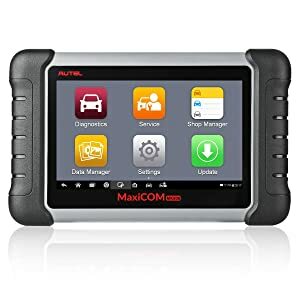 At this price point, the Autel MaxiCOM MK808 offers way more than you would expect. It is sturdy, lightweight, and features a beautiful 7″ touchscreen display. Running on Android 4.4, the diagnostic scanner has no problem performing rapidly and with accuracy. MK808 has a simple and practical size of the fuselage. This airbag scanner gives you full diagnostic access to every system in your car. It can read and clear DTCs in all car systems, including ABS, SRS, airbag, fuel, emission, transmission, lights, brakes, and wiper systems. On top of all that, it packs special features such as EPB (electronic parking brake) and SAS (steering angle sensor) reset and services like BMS (battery management system) and anti-theft protection. This IMMO service protects against vehicle theft when the owner loses their key by disabling the lost key and reprogramming a spare. With its wide array of features, this airbag scanner is evidently built for professionals who demand more versatility and overall functionality in their diagnostic tools. Professionals in an industrial setting would get maximum value from this tool, which is designed with durability and performance in mind. Running an airbag diagnostic tool in an Android environment is a recipe for productivity. That much is evident when using the X431 Pro to conduct full vehicle diagnostics. The tablet-like airbag code reader is powered by a rechargeable 3000 mAh lithium-polymer battery. It sports a large 8″ screen with a resolution of 1024×600. Under the hood, 512MBs of RAM ensures that error code diagnosis is done rapidly and accurately. The scanner also features 32GB of internal storage and an expandable memory slot for additional storage space. Launch X431 V guarantees 100% genuine with 2 years free update. Its software is more open-ended and as such, you can download and use a wide variety of apps, provided they run on Android. Despite its wide profile, the airbag code reader is quite sturdy. The manufacturers have paid special attention to its resilience by giving it a shockproof case and making it water resistant. 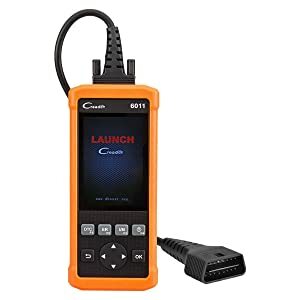 Ordinary functions such as reading and clearing DTCs, accessing live data streams, injector, and key coding support, and other automotive diagnostics can be performed easily using this airbag tool. Tasks as simple as clearing the check engine light and as complicated as code injection can be performed with equal efficiency. Special features such as Bluetooth, wireless connectivity (when WiFi is available) and the multi-touch capacitive display feel gratuitous but contribute greatly to its functionality. You will get two years worth of free software updates with the X431 Pro. Not everyone will need an airbag code scanner, but for those who do, more features do not always mean better value. If you need a lean, mean diagnostics machine, steer clear of perks such as massive touchscreen displays since these attract a larger price tag. Instead, focus on the device’s scanning parameters, its build quality, its level of compatibility, and generally how well it will serve the specific purpose you need it for. Airbag code scanners save you the trip to the mechanic every time the airbag lights malfunction. The right scanner will allow you to diagnose, clear, and reset all your vehicle’s systems, effectively extending their longevity. Cost shouldn’t be an issue for professionals, but non-certified technicians should be careful not to spend too much on a scanner since they can be quite pricey. Powerful features are important but not absolutely necessary for ordinary day-to-day vehicle diagnostics. Overall, when deciding on which airbag code scanner to buy, consider how much you expect to use it, the vehicle systems you wish to diagnose, and how tight your spending budget is. No matter how specialized your diagnostics processes get, this list has all the equipment you’ll ever need to understand how your vehicle is performing, and what you can do to enhance that performance. The Foxwell NT630 Elite is an auto scanner that read and clear codes and turn the engine light off. What’s more about this Foxwell Scanner? Try NOW!! Both Launch CRP123 and CRP129 are unquestionably of the top scanners of Launch. You want to see the Launch CRP123 vs CRP129 Scan Tool? Read the review now! Konnwei OBD2 KW850 Scan Tool is a professional scan tool which was developed in an attempt to help car owners to access the vehicle’s computer. The Review of the Best 12V Battery Tester: Special Features – Coverage – Pros and Cons – Who is it for – Comparison Chart.